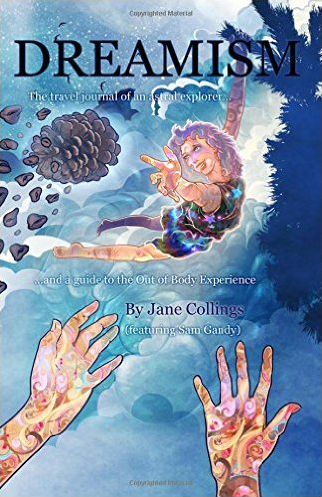 Today I'm reviewing the book Dreamism: The travel journal of an astral explorer by Jane Collings (featuring Sam Gandy). Collings and a second author sent me copies of their books at the same time. The other author's book arrived first and I started reading it, but coming from the UK, Collings' book arrived later. I was traveling and in transit at the time, so somehow I lost track of it and I couldn't find it for months. Then, late last December, my wife Kathy lost some important paperwork and I was helping her look. I looked under the car seat and found Dreamism. "Oh yeah. I wondered what happened to you." I began reading right away, but it took a while to finish. "Everybody's talking 'bout Bagism, Shagism, Dragism, Madism, Ragism, Tagism, this-ism, that-ism, ism, ism, ism." Add Dreamism to the list, right? But the book was actually quite good. Unlike the previous book I reviewed, this book is 296 pages long, has nice tight margins, and no wasted space: There's a lot of content. The first quarter of the book is general information about OBEs, but the rest of the book is exactly what the subtitle says: a travel journal. Collings details lots and lots of her experiences, both lucid dreams and OBEs. This was much more satisfying than the previous book I reviewed: You know how I love OBE narratives, and the author was writing from personal experience. It felt very genuine and warm. In a way, it reminded me of Vicky Short's book Persephone's Journey with its emotional roller-coaster of relationship problems, self-esteem issues, and life lessons, although Persephone was just slightly better. Chapter 1 is really the introduction. Collings was introduced to astral projection and lucid dreaming when she attended a workshop "being held by a guy called Todd, in a converted water tower in Woolwich." (pg. 14) Right away, I knew this almost had to be well-known OBE teacher, Todd Acamesis, although she doesn't call him out by name. "...but then out of the blue and after a long night drinking in Nottingham, I had an absolutely amazing and sustained Out of Body Experience." One of the hallmarks of a good book is that the characters grow, mature and find new strengths, and Collings does just that throughout. Her stories start to take on a more serious tone. "What's the difference between a Lucid Dream and an OBE and how can you tell them apart?" The whole "Higher Self Now" idea was invented by William Buhlman (although she doesn't credit him either.) Based on Buhlman's books, I've always inferred that the command is used to merge with your Higher Self, or to achieve some kind of cosmic blissful state beyond ordinary OBEs. Collings uses it frequently, but only to re-focus, or change locations, or even to gain clarity (as opposed to Buhlman's original "Clarity Now!"). I think she might have misinterpreted his intent. Buhlman's latest book, Higher Self Now!, talks primarily about merging with the Higher Self upon death. When all is said and done, I suppose what really matters is not the words themselves, but the meaning and intent. Deep. I like deep, although I didn't find too many quotes like this. One thing I found valuable was her discussion of how to work with the "trans-personal chakras". Instead of focusing on the crown chakra, she talks about doing energy work with three different levels of the crown chakra that extend outward six, twelve and eighteen inches above the head. Chapter 3 is "The 'Secret Egyptian Eyelid Technique' and the Pineal Gland" which has some interesting information and even diagrams. Chapter 5 is "Tips for Lucid Dreaming." Collings gives several good tips and techniques. From there she launches into her OBE narratives, weaving various tales and using them to make observances about OBEs (also like Short). Collings is from the UK, and uses several British colloquialisms / slang, which made it both endearing and difficult to read at times. Half of my teammates at work (including my manager) are based in the UK, so British phrases like "torch" versus "flashlight," or "petrol garage" versus "gas station" don't bother me. Plus I really love the British comedy "Coupling" (I have the whole collection on DVD. If you've never seen it, watch an episode; it's hysterical). So I'm used to hearing expressions like "sod on." Even given all that, Collings uses terms I had never heard before. For example, "holiday snaps" (pg. 77) or "Sooo jammy!" (pg. 104) or "full of beans" (pg. 108). My favorite was a reference to a "tannoy." (pg. 245) Even the dictionary app on my phone threw up its hands and said, "I got nothin', man." It turns out that a tannoy is what we commonly call a "PA system" or "public address system" or overhead loudspeakers. Perhaps the most amusing was when she described herself as "Gutted!" (pg. 152) when she forgot something important in an OBE; it gave me a good laugh, both because of the slang, and because I've felt that way myself! The stories were amusing and well written, but the book definitely needed a proof reader. I caught lots of rookie mistakes, especially with words like "its" versus "it's". And "OBEs" spelled as "OBE's" (the latter especially in Sam Gandy's chapter). For some reason, the apostrophe problems didn't bother me much; I read past it and moved on. Despite that, the writing was mature: she's a good storyteller. Some of her stories didn't make it clear whether she was in an OBE or a lucid dream. To her credit, she often admits (in the experience) that she wasn't exactly sure. Some of her "OBEs" sounded a bit too much like lucid dreams to me, but who am I to judge? I wasn't there. To be brutally honest, I was a bit disappointed that Collings' OBE narratives weren't more "otherworldly." They were like "I went into a shop where a lady dressed in blue stood..." You know: normal everyday stuff. In my OBEs, everything seems very otherworldly: slipping through walls, gliding down hallways, floating atop ceilings and flying over vistas. Author Michael Ross described a "delicious feeling and sensation of eeriness'" (still one of my favorite quotes from an OBE book.) This book lacked that. The last chapter, 10, titled "Science Chapter" was written by Sam Gandy, and it has a very different feel from the rest of the book. It's a rushed attempt to pull science, consciousness studies, quantum physics, and OBEs together. He does a rushed interpretation of the books and meta-analysis of Dean Radin, Rupert Sheldrake and many other scientists whom I greatly admire. This only whetted my appetite. I'd like to see Gandy write an entire book on the subject and not be so rushed. It's an interesting read. I'll give it 3 and a half stars out of 5.
l think you mean 'sod off' not 'sod on'- means - 'get lost'. "If you cast your mind over it for a few moments whilst you're lucid, you'll often be aware of what feels like an unquestionable fact...your waking life is the actual dream. It's a dream your soul is having." l think that's a misconception. Too buddhistic imo. The physical world IS real - it's our state of consciousness that's 'dreamlike'.